The Crucial P1 SSD isn't quite the first at anything, but it is still a very novel product. It is the second consumer SSD on the market to use four bit per cell (QLC) NAND flash memory, after the Intel SSD 660p. It's the second QLC SSD from Micron, after their 5210 ION enterprise SATA SSD that started shipping to select partners in May (and is now starting to be more widely available). More importantly however, it is the first consumer NVMe SSD that Micron has actually shipped. For all of their storied history in the SSD industry, Micron is pretty much the last SSD maker to enter the consumer NVMe market; and not for a lack of trying. The company's first attempt at an NVMe drive, the 2016 Ballistix TX3, was ready to hit the market but was canceled when it became clear that it would not have been competitive. So this drive is a very important one for the company, despite the fact that its use of an NVMe/PCIe interface is hardly the most interesting aspect of the Crucial P1. Under the hood, the Crucial P1 starts from the same basic ingredients as the Intel 660p: Intel/Micron 64-layer 3D QLC NAND and the Silicon Motion SM2263 controller. Micron has added their own firmware customization atop Silicon Motion's work, and the design of the Crucial P1 differs from the Intel 660p in several aspects — so this is not a case of two brands selling the exact same reference design SSD. Where the Intel 660p includes just 256MB of DRAM regardless of drive capacity, the Crucial P1 includes the same 1GB DRAM per 1TB NAND ratio that is used by most mainstream SSDs. This extra DRAM on the Crucial P1 should enable marginal improvements on benchmarks and workloads that touch large amounts of data, and probably allows a slight simplification to the drive's firmware. The Crucial P1 also has slightly lower usable capacities, eg. 500GB instead of 512GB, so there's a bit more spare area for the controller to work with. And whereas Intel's 2TB 660p is still a single-sided M.2 module, the upcoming 2TB Crucial P1 will have NAND and DRAM on both sides. The rest of the architecture of the Crucial P1 follows the same general strategies as the Intel 660p. The SM2263 controller is the smaller four-channel design from Silicon Motion's current generation, though it is a step above the DRAMless SM2263XT variant. The host interface is a PCIe 3.0 x4 link, but the Crucial P1 barely needs more than the PCIe 3.0 x2 link used by some competing entry-level NVMe controllers: peak sequential transfers for the P1 are only about 2GB/s. The use of QLC NAND means that the Crucial P1 is highly reliant on its SLC write cache to enable performance that can exceed what SATA SSDs provide. This is because the drive's QLC NAND isn't all that high performing on its own; it's dense, but it takes longer to program a block than MLC or TLC NAND. TLC for that matter is cache-sensitive for similar reasons, but QLC in turn has cranked up the importance of cache sizes and caching algorithms another notch, as the performance delta between the cache and the actual storage has increased. For Crucial's P1 the SLC cache is variable in size, and on a nearly-empty drive the cache will be substantially larger than what is usually found on TLC SSDs. Consumer drives that use TLC NAND often try to limit the maximum size of their SLC caches in order to reduce the amount of background work necessary in the event that the SLC write cache should overflow. The Crucial P1 is designed to do as much as possible to avoid falling off that performance cliff, rather than attempt to mitigate the effects when it does happen. When the SLC cache fills up, writes to the P1 get very slow. The P1 doesn't bypass the cache when it is full, so everything written to the drive is written to SLC first before being folded into QLC blocks. (This helps the P1 offer similar partial power loss protection to the Crucial MX series of SATA SSDs.) The P1 also tends to keep data in SLC so it can serve as a read cache instead of aggressively folding data into QLC blocks during idle time. All told, the caching strategy of the Crucial P1 maximizes performance and endurance for typical lightweight consumer/client storage workloads, but at the cost of performance on storage-intensive workloads. The P1 is definitely not the SSD to use in a workstation that regularly reads and writes datasets of many gigabytes, but it should be fine for more common desktop usage that is fairly read-heavy and only does multiple GB of writes on rare occasions such as when installing large software packages. This is in some sense just an amplification of the trends we saw as the SSD market moved from MLC to TLC NAND, but we do now have high-end TLC drives that can maintain high write speeds even after their SLC caches have filled. This is not true of the current two consumer QLC SSDs, and will probably always be a significant weakness of QLC SSDs. The other major tradeoff to the Crucial P1's use of QLC NAND is the lower write endurance compared to TLC SSDs. The P1 is rated for about 0.1 drive writes per day under a five-year warranty, while most consumer SSDs are rated for 0.3 up to about 1.0 DWPD for either three or five years. The P1 somewhat mitigates this by only offering large capacities of 500GB and up, so the total write endurance starts at a minimum of 100TB. This is adequate provided that most of the drive's capacity is used for static data. If the P1 has to hold hundreds of GB of data that changes as frequently as a web browser's cache and history, then 0.1 DWPD won't be enough. But in a more normal scenario where most of the data is media like movies and video games, then there's no problem. In spite of the tradeoffs of lower performance and endurance, QLC drives like the Crucial P1 are worth a look because of their potential to also have significantly lower prices. At around 22¢/GB currently, the P1 isn't setting any records yet. Several industry reports have indicated that yields of Intel/Micron QLC are still poor, so the production costs of SSD-quality QLC aren't meaningfully lower than TLC yet. The other major NAND manufacturers are being less aggressive about bringing QLC to market, but once they have introduced their competitors we will probably see QLC products offering a more significant discount over TLC. NAND prices in general are also in decline, with some higher-volume TLC products leading the way ahead of even the QLC drives. The primary competition for the Crucial P1 is its close relative Intel 660p, as well as other entry-level NVMe SSDs. 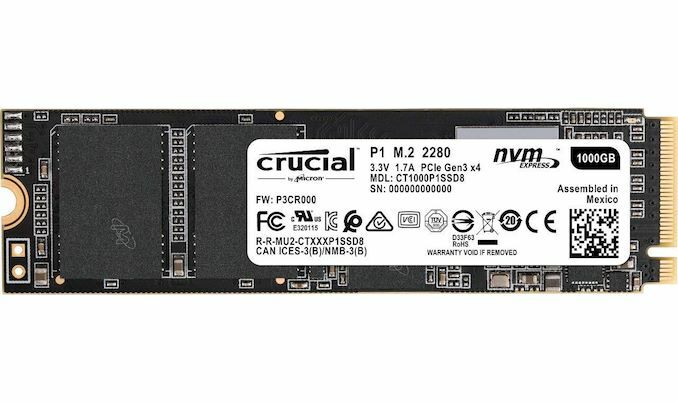 There is a low-end NVMe market segment with numerous options, but they are all struggling under the pressure from more competitively priced high-end NVMe SSDs. Products like the DRAMless Toshiba RC100 and HP EX900 haven't been able to get any traction when the HP EX920 is hitting the same prices. Thus, it is also fair to compare the Crucial P1 against such faster NVMe drives. The P1 is a modest step up in price over mainstream SATA SSDs, so this review includes benchmark results from the Crucial MX500.
" The company's first attempt at an NVMe drive was ready to hit the market but was canceled when it became clear that it would not have been competitive." I just paid $139 for a WD Blue 1TB 3D m.2 a couple of days ago. Haven't even beaten on it thoroughly. Look at what happens with DRAM every time. DDR2 comes out and DDR1 becomes more expensive. Rinse repeat.